I have a new flourless cookie recipe for you guys. This time it is Strawberry Shortcake Cookies. If you like my flourless lemon cookies, you will probably love these as well. This flourless cookie recipe is super simple. All you need is 4 simple ingredients! I used freeze dried strawberries in this recipe. However, I think you can also use fresh strawberries if you add a little extra cashew butter to balance out the liquids. 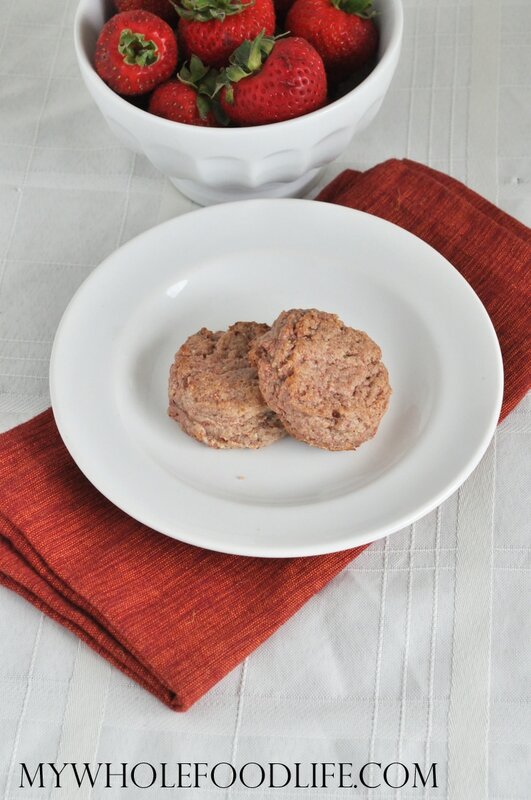 These healthy cookies are vegan, gluten free and paleo approved. They are super easy to make. Our batch didn’t last the day. This recipe makes a small batch, so if you are feeding a lot of people, you may want to double the recipe. If you want to make your own cashew butter, just watch this simple video. Only 4 simple ingredients to make these healthy cookies! In a food processor , combine all the ingredients. Blend until everything is mixed. Using a cookie scoop , drop cookies onto a lined baking sheet . I used my palm to flatten each cookie a little. Let the cookies cool completely before removing from the baking sheet. They will crumble if still warm. Keep these cookies stored in an airtight container. They should last a couple weeks that way. Enjoy! I would consider serving these at a Vegan"tea" bridal shower I am hosting in a few weeks. Do you have any other menu ideas for me?